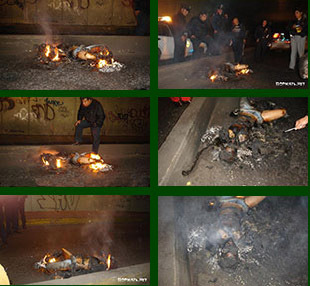 These are six images of a burning Brazilian woman's carcass from the July 2007 TAM Airlines crash in Congonhas, Brazil, which have been touted by several websites as an example of Spontaneous Human Combustion (they don't mention the air crash). The images are of a very graphic nature, so they have been compiled in smaller form by Garth Haslam, August 2016. The original images are from the CharonBoat website, but are too graphic for full inclusion in Anomalies, and unnecessary for the investigation. For those who still wish to see them, here's the outside link: CAUTION: Graphic Photos - Link Here.